Pop hits start and finish this stage musical version of Green Day’s American Idiot. The production, in its third U.S. tour at the National Theatre, opened strong with “American Idiot” and ended with a touching cast rendition of “Good Riddance (Time of Your Life).” However between the curtain rise and fall is a performance that certainly packs all the moody, angst-filled energy you would expect but suffers from a story that feels too contrived to be anything more than a 90-minute live-action music video. Green Day fans will certainly come out to listen to Billie Joe Armstrong’s Rock Opera album come to life on the stage and they will not be disappointed with the tunes. There is plenty of eye-liner and broody, hunched-over dance moves that feel ripped from Spring Awakening. Also I swear I saw at least one move from the Contemporary Eric viral video. The story focused on three rebellious youths who hope to escape their suburban digs and head into the city. Johnny (Jared Nupute), Will (Casey O’Frrell), and Tunny (Dan Tracy) each take different paths: Will decides to stay at home when her girlfriend Heather (Mariah Macfarlane) reveals that she is pregnant. Tunny and Johnny both head into the big city but Tunny decides to enlist in the Army. All by himself, Johnny falls into a drugged-filled bender that threatens to swallow him whole. There is a lot of potential here but there really isn’t enough depth get the audience truly invested. Don’t get me wrong, the young cast truly gives it their all but it’s not enough to elevate a lackluster narrative. The entire show runs on a very anti-establishment theme that feels very punk and very Green Day but with all that anger and frustration the show doesn’t feel like anything more than a Jukebox musical. 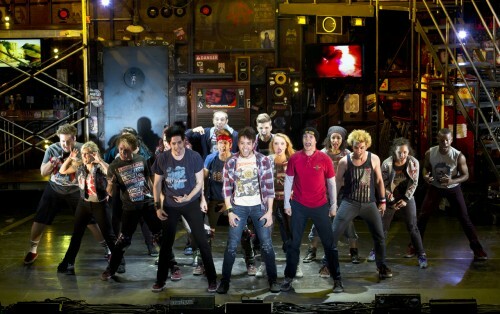 American Idiot, performs through February 23rd, 2014 at the National Theatre. The National Theatre is located at 1321 Pennsylvania Avenue Northwest Washington, DC 20004. Closest Metro stop: Metro Center (Red/Orange/Blue line). Tickets start at $58 For more information call 202-628-6161.